Through the Past, Darkly (Big Hits Vol. 2) is The Rolling Stones' second official compilation album, released in 1969 shortly following Brian Jones's departure from the group and subsequent death. The album was released by Decca Records in the United Kingdom and London Records/ABKCO Records in the United States. In September, Through the Past, Darkly (Big Hits Vol. 2) — dedicated to Jones — appeared with a limited edition octagonal-shaped album cover. Because their first "Big Hits" compilation had been released in separate formats, with the Aftermath-era material appearing only on its UK edition, the American edition of "Big Hits Vol. 2" included hit singles from the "Aftermath" period. The British track listing included the more obscure "You Better Move On", from The Rolling Stones' self-titled 1964 debut EP and "Sittin' on a Fence", an Aftermath outtake originally released in 1967 on the US-compiled Flowers album. In addition to those songs, many tracks, notably single-only releases, were collected for the first time on a UK Rolling Stones album: "Let's Spend the Night Together", "Ruby Tuesday", "We Love You", "Dandelion" and "Honky Tonk Women". Both versions of Through the Past, Darkly (Big Hits Vol. 2) proved to be popular releases, reaching #2 in the UK and US with enduring sales. The name of the album is a play on a line from the KJV translation of I Corinthians 13: "For now we see through a glass, darkly, but then face to face: . . .", but it is more likely the Stones intended an homage to Ingmar Bergman and his 1961 film Through a Glass Darkly. In the inside flap of the album, there is a tribute to Jones, which reads: "When this you see, remember me, and bear me in your mind. Let all the world say what they may, speak of me as you find." 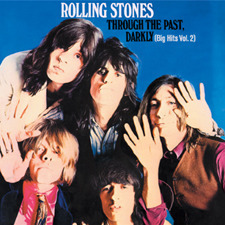 In August 2002 the US edition of Through the Past, Darkly (Big Hits Vol. 2) was reissued in a new remastered CD and SACD digipak by ABKCO Records. The UK counterpart is currently out of print. This is one of the great party records. All the cuts are favorites, all are terrific—loud, tough, flashy rock and roll. Even if you already have every song on Flowers, Aftermath, Between the Buttons, and Beggars' Banquet, all together they've probably never sounded as good as they do on this LP. Whether or not the songs were chosen with great care or virtually at random, they form an album of tremendous impact, just like any record of Little Richard's greatest hits.